She came shooting off the wall like a human torpedo, gliding through the water with cold, relentless precision. Unleashing her incomparable, undulating dolphin kicks, Natalie Coughlin began to pull away from the field in the l00-meter backstroke, popping to the surface nearly a body length ahead of her closest pursuer. From that prime vantage point -- with a picturesque view of the Athens sunset, a mere 35 meters between her and redemption -- Coughlin was as good as gold. The most talented female swimmer of her generation took a deep breath and closed in on the prize she'd been chasing for more than a decade. Six days shy of her 22nd birthday, Coughlin propelled herself backward through Lane 4, seven competitors and untold degrees of doubt, pain, and disappointment in her wake. Get to the wall, and she would forever be an Olympic champion, the haters and the traditionalists be damned. Just a dozen or so more strokes and she'd finish a 4-year struggle for self-determination that summoned every ounce of will in her being. Just 25 meters to go, then 20, and the only question seemed to be whether Coughlin would break her own world record. Six thousand fans at the Athens Aquatic Center were cheering her home; tens of millions more would experience the suspense on television. And then . . . Oh, no. This cannot be happening. Coughlin felt an energy crash coming on -- that insidious, instant loss of zip that every swimmer dreads. She grimaced as the lactic acid ripped through her leg muscles; instinctively, she bit down on her lower lip to combat the pain. The last time this happened, in the final individual race of Coughlin's unmatched collegiate career, she had appeared so dead in the water that her father, Jim, a police sergeant in her working-class northern California hometown of Vallejo, had barely fought back the urge to race from the stands to rescue his little girl. On that March 2004 in College Station, Texas, site of the NCAA Championships, Coughlin had been passed by two swimmers down the stretch of the 200-meter backstroke -- the only time in 4 years the University of California, Berkeley, superstar had lost a meaningful race. Now, 5 months later, the nightmare was happening again. Nooo! the voice inside Coughlin's head shrieked. Not this! Not now! Her arms felt like redwood stumps, her legs like jelly. She veered close to the lane line, her normally perfect technique beginning to give way to panicked thrashing. She was holding on, but for how long? No one in her line of vision was making a charge -- certainly not Haley Cope, once her close friend and Cal teammate, now just another obstacle between Coughlin and her rightful gold. It had to be hers, after all she'd been through; after all she'd sacrificed to swim this race on this warm Monday night. The threat, Coughlin knew, was unseen. Over in Lane 1, blissfully shielded from the wind-induced currents rippling through the pool, was Zimbabwe's Kirsty Coventry, the very same Auburn University swimmer who had caught Coughlin on that awful night in College Station. Coventry was coming, hard, as Coughlin figured she would be. The previous night, in her semifinal heat, Coughlin had eased up to win in 1:00.17, setting an Olympic record. She was the only woman ever to have gone under a minute in the event, had held the world record (59.58) the past 2 years, and owned the four fastest times in history. Now, however, it wasn't about the clock. It was about finding a way to get to that wall before her worst fear was realized. Fifteen meters to go, and Coughlin perceptibly slowed. She was sinking like the Titanic, and no lifeboat loomed. Her parents, Jim and Zennie, gripped each other's hands tightly, their stomachs in knots. Coughlin's sister, grandparents, and boyfriend watched beside them in agony; there was nothing they could do but pray. Coventry was edging closer, and Coughlin seemed to be coming back to the field as if hindered by an underwater rope. This isn't happening, she thought. Please, don't let this be real. Were the gods of swimming this cruel? Were they taunting her once more? They'd given her talent, drive, and intelligence, along with an uncanny ability to feel the water that most sharks would have envied. Her "physical IQ," in the words of one stroke guru, was astoundingly high, meaning she was able to comprehend and effect specific technique alterations in a manner of seconds. Yet at so many key moments before the 2000 Olympic Trials, when her shoulder gave out, and at the 2003 World Championships, when her fever spiked and her body collapsed -- fate had conspired against her. Now, once again, everything was falling apart -- and oh, how this would hurt. She could see the headlines ("Coughlin Comes Up Short") and anticipate the disparaging words that would be whispered in Athens and on pool decks across America. She could picture the tears running down the face of her coach, Teri McKeever, who was crouching in the stands behind the finish line, too nervous to watch with the rest of the US delegation. She could imagine the legions of traditionalists weighing in on McKeever's methods and how they had doomed Coughlin to failure. And, clear as day, she could envision her former youth-club coach, Ray Mitchell, and hear him bellowing, "I told you so." It was all unthinkably devastating, and for a split second, Coughlin felt herself go numb. And then, in an instant, the fire returned. Screw that. This is my moment. For the first time in her life, she had total, unequivocal clarity. Ray's not in charge anymore. I am. I decide how this ends, and I choose victory. I'm in control now. Coughlin jerked her right arm up from the water, rotated backward, and slapped it back to the surface. Her kicks became steady and vigorous. She no longer saw Mitchell's face -- nor could she see McKeever's, or those of her Cal or US teammates, or her friends or sister or parents. In her head there was only darkness, the shade of the predawn sky in Concord, California, when, as a teenager, she'd arrive at the pool before Mitchell and her Terrapins Swim Club teammates and sit in her car for 10 minutes, staring into nothingness and getting her mind ready for the task at hand. Then Coughlin would get out of the car, unlock the gate, and unravel the pool cover, shattering the early-morning silence by diving into the water and beginning another grueling practice. Alone in the dark, Coughlin had been in control of her destiny -- before the shoulder had given out and the rumors cropped up and the thoughts of quitting had begun to fill her mind. Saved by McKeever's intuitive touch, Coughlin and her coach had created an alternative model for success; yet even now, after all her triumphs, there were doubters -- including some of her trusted college teammates -- who expected her to choke when it mattered most. Well, she had a surprise for them, for Mitchell, and for everyone who'd ever questioned her mettle: That wasn't going to happen. After thousands of miles' worth of laborious laps to prepare for this moment, she could gut out these last 10 meters. Yes, she wanted to win for her country, her family, her school, and, most of all, McKeever. But the last 10 meters would be for her, and her alone. Slap. Her left arm hit the water, then her right arm. I will not lose. One stroke to go, maybe, if she could time it right. Her left arm reached backward and extended, glided through the water, and touched the wall. Coughlin's heart was racing. This was the moment that would define her as an athlete, and she'd never wanted anything so badly. With her right hand, she pulled off the outer swim cap she'd worn over her Team USA model, then lifted her goggles and looked to the scoreboard. She squinted upward, her eyes disbelieving. Fourth? I got fourth? That can't be right. She scanned to check her time: 1:00.37. It wasn't a great effort by her standards, but fourth? She closed her eyes and took another look. Five seconds passed -- not an especially long time, except when you're thinking your dreams have been dashed. Then, finally, Coughlin saw it: a big number "1" on the right of the scoreboard. Now she understood: The "4" had been a trick of the light. Normally, the scoreboard at a swim meet instantly rearranges itself at the completion of a race to rank the finishers from top to bottom. In Athens, for whatever reason, there had been a delay, meaning Coughlin, who'd raced from the fourth lane, was still fourth on the board when she'd looked up. Now, at long last, the board rearranged, and her name was on top. That "1" was the loveliest, most comforting numeral she'd ever seen. All the muscles in Coughlin's body relaxed in unison. Eyes closed, she raised her fist to the sky, then lifted it again, and again, and again. Her face was a mixture of resuscitated relief and unfettered joy. She had become the first US woman in Athens to capture a gold medal, and she had done it her way. Six thousand fans were on their feet cheering while tens of millions of viewers across the globe sat on their couches, watching her pretty face beaming across their television sets. None of them, not even the people closest to her, could see the scars. But that didn't matter. Not now. As the sun went down on Athens and Coughlin's star began to shine, the healing process officially began. 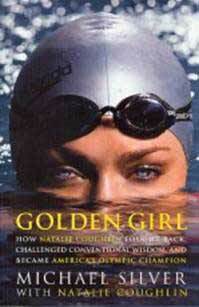 Reprinted from: Golden Girl: How Natalie Coughlin Fought Back, Challenged Conventional Wisdom, and Became America's Olympic Champion by Michael Silver � 2006 Michael Silver. Permission granted by Rodale, Inc., Emmaus, PA 18098. Michael Silver is a senior writer for Sports Illustrated and the coauthor of many sports memoirs, including those of Dennis Rodman, Kurt Warner, and Jerry Rice. He lives in Northern California with his wife, Leslie, and their three children. Copyright � 2006 ClevelandWomen.Com. All Rights Reserved.